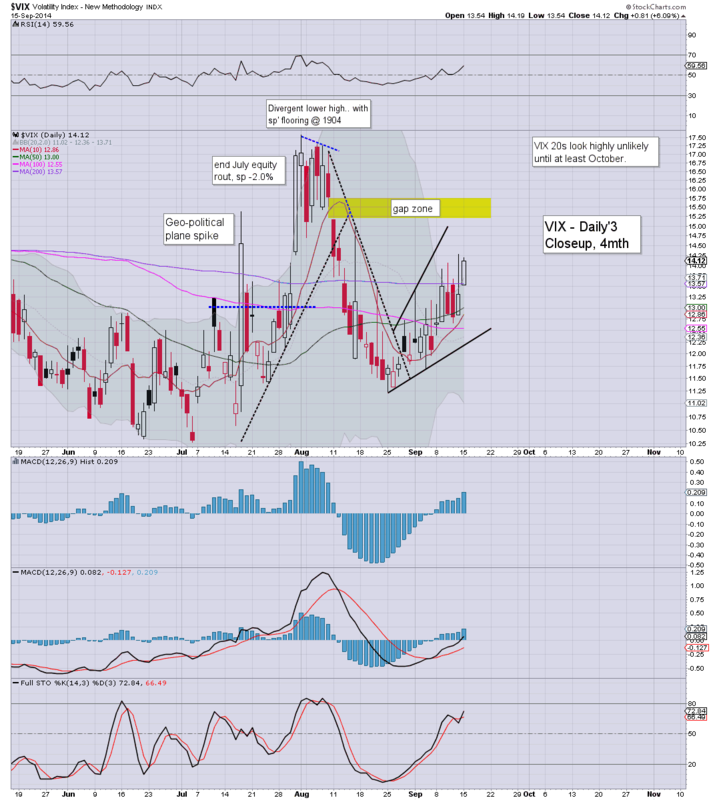 Whilst equities saw continued minor weakness across the day, the VIX managed to hold minor gains, settling +6.1% @ 14.12. 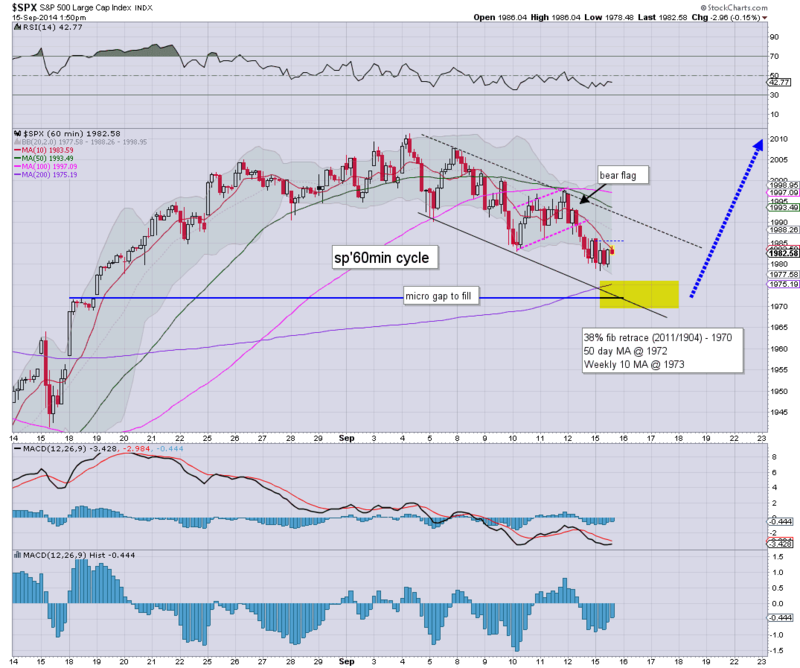 Near term outlook offers the 15s, before renewed downside. VIX remains relatively low.. at best, equity bears might manage the mid 15s, whether tomorrow.. or FOMC-Wednesday. US equities closed somewhat mixed, sp -1pt @ 1984 (intra low 1978). The two leaders - Trans/R2K, settled -0.4% and -1.2% respectively. Near term outlook is for another micro wave lower to sp'1973/70 zone, before renewed upside. 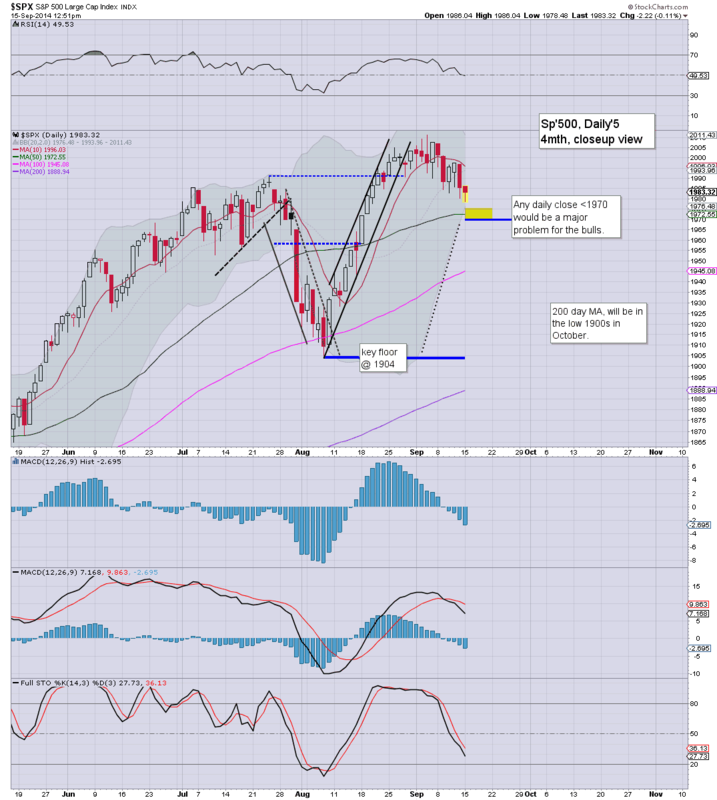 We're still in a slow down trend, and the low sp'1970s look a reasonably easy target. The only issue is do we floor there... and then a new multi-week up wave...into October. Right now,..... I'd guess yes. The usual bits and pieces to wrap up the day... across the evening. This remains a market that is not so much about max pain.. as max annoyance. 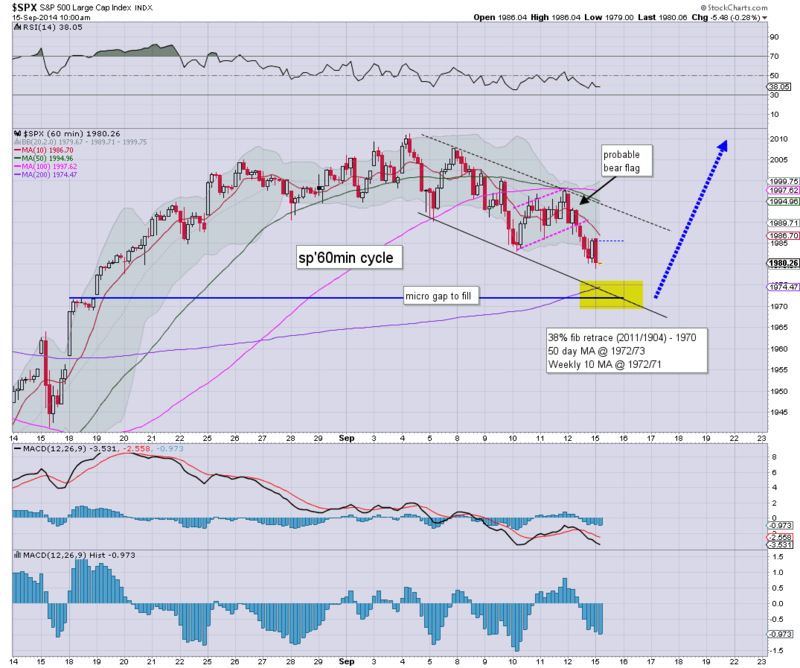 A micro cycle has taken the sp'500 fractionally positive, and taken the edge off the momo stocks' declines. Barring a break >1995... the immediate trend remains 'weak'. However, bears did manage another lower low...with the VIX in the 14s. 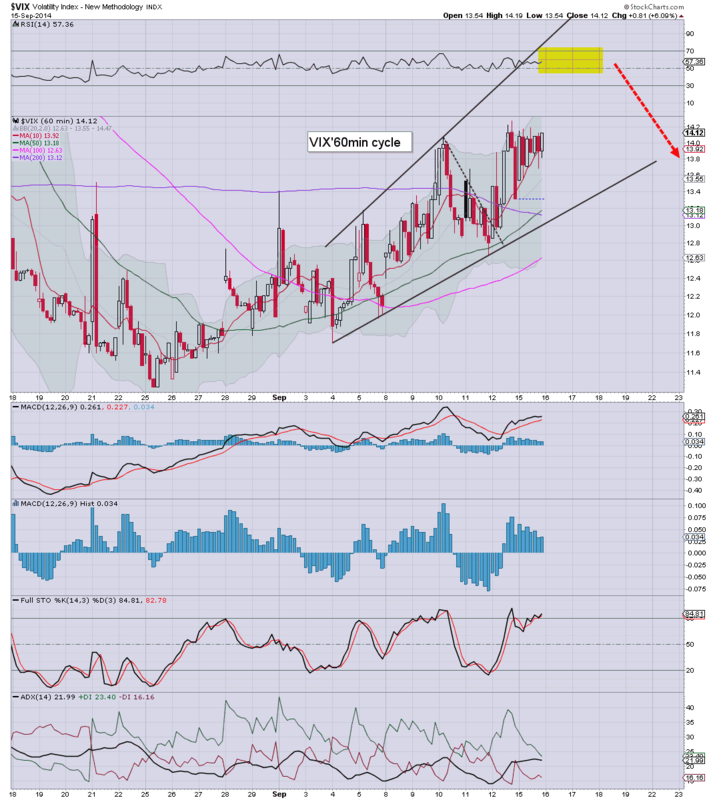 I'm still seeking the sp'1973/70 zone..with VIX 15s... before a key turn ..back upward. Perhaps more than anything, equity bears should be seeking a VIX daily close in the 14s. 3.36pm.. Price action remains 'weak chop'. Certainly, no clear floor yet...not least in the momo stocks or the R2K. Equities remain seeing the same weak chop that we've seen since the sp'2011 high of Sept'4. VIX is holding minor gains, +4% in the 13.90s. Momo stocks remain under rather severe pressure, with the R2K -1.3%. What to make of today? Broader market remains relatively stable. 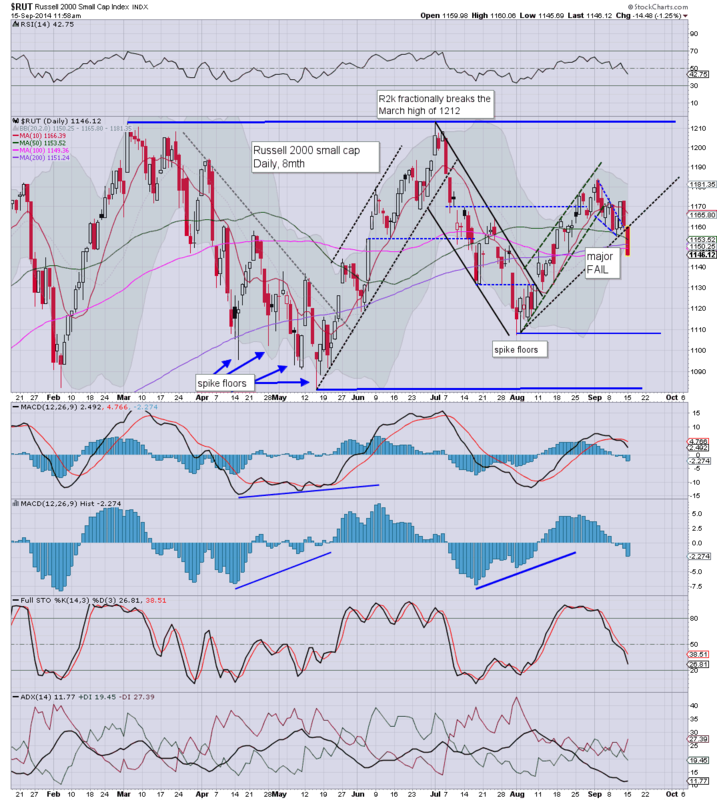 Whilst there is far more significant weakness in the R2K, the broader market is still only moderately lower. Primary downside target remains the low sp'1970s, with VIX 15s (briefly)..before a renewed push higher into October. 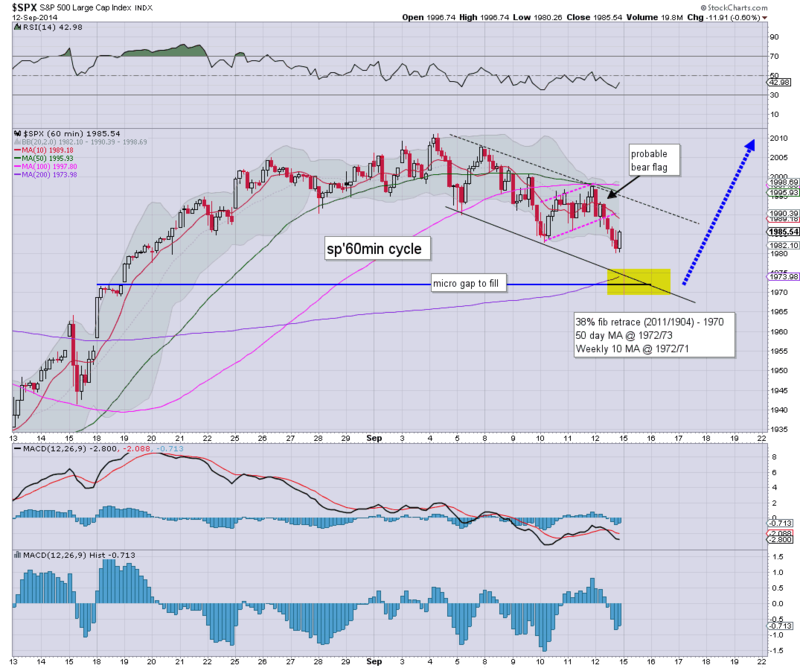 The Dow is especially suggestive that the broader market remains comfortably bullish. Yes, there is sig' selling in the small caps - notably the momo stocks of TSLA, TWTR, etc... but as a whole... the market is looking like it will level out by tomorrow. 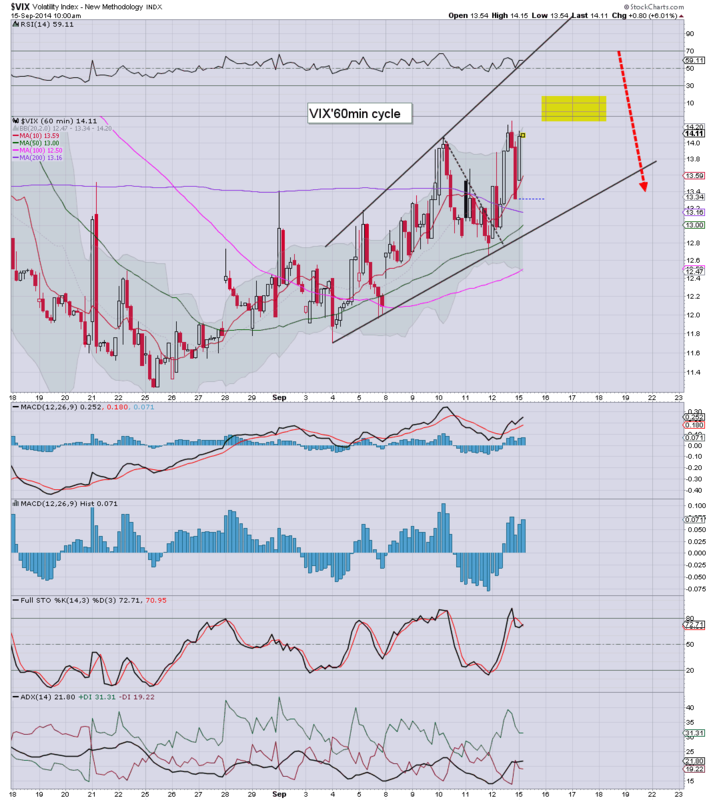 *I remain seeking to pick up a sig' long-index block.... somewhere in the 1973/70 zone.. with VIX 15s. For now, there is no hurry.. not least ahead of the Fed. The carnage continues... with increasing talk of 'the dividends will be cut'. 1.10pm.. micro rally to evens. sp'1984. There is some serious disparity between the indexes this morning. We have the Dow fractionally higher, the sp/trans/nyse comp' moderately lower, whilst the R2K - along with the momo stocks.. getting slammed, -1.3%. *ViX holding moderate gains of 5% in the low 14s. I'm not sure what to make of today. Certainly, we're on the weak side, but the headline indexes aren't warning of any trouble. The only real notable weakness is in the momo stocks, which are getting whacked..
Equities remain seeing minor weak chop, and its a bit of a messy start to the week. With the break under the Friday low of sp'1980, it remains the case of lower lows. There remains zero reason why another micro cycle won't take the market to at least 1973. A tiresome start to the week... and if you've sent me an email or PM recently... don't expect a reply. My webhosts are a bunch of idiots, and have once again changed the server settings without telling any of their clients. Regardless.. no reason for anyone to be short... there is NO downside power. 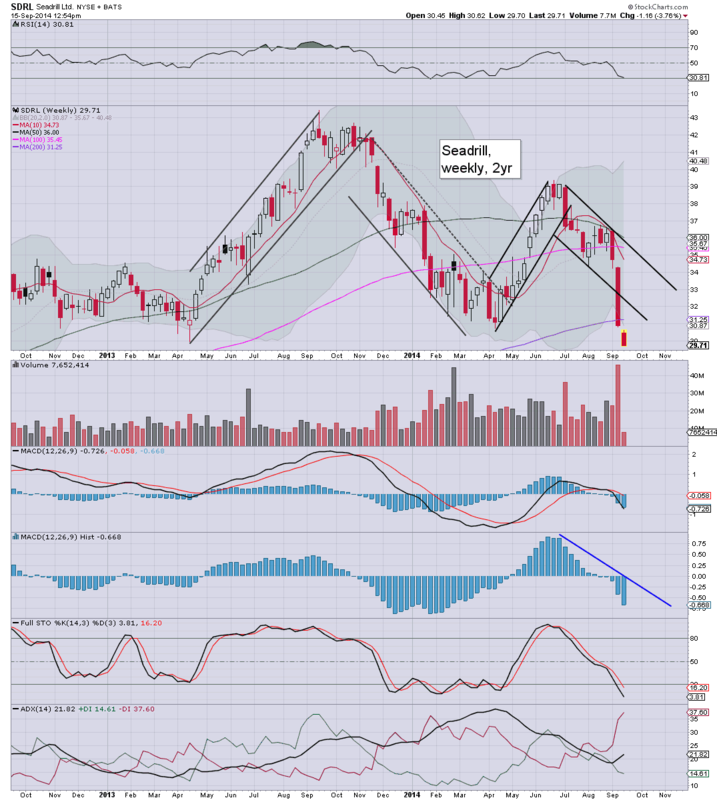 ..and for the moment, no point being long....until we've at least tested the cluster of support in the low 1970s. Notable weakness, TSLA -6%. I've no idea why, did Musk say anything about it being over-valued again? 11.13am.. All the momo stocks are really starting to stink, AMZN -2.9%... FB/TWTR following. Its not a good sign for the equity bulls. 11.22am.. Dow.. +3pts.... R2K -1.3%..... seriously...that is one wacky divergence. US equities are well on the way to the low sp'1970s, where there are multiple aspects of support. VIX is +6% in the low 14s. The 15s are viable today, and would make for a very natural cyclical top. ...so... we're on the way. 10.34am... ohh great...its already bounce time. Tiresome. .... and for anyone short.. this is just another waste of time. Good morning. Futures are a touch lower , sp -2pts, we're set to open at 1983. USD is starting the week on a positive note, +0.25%. A busy week is ahead, FOMC (QE taper'7), Alibaba IPO, the Scottish vote, and quad-opex on Friday. So, equities have largely recovered most of their overnight losses, although even those declines barely amount to 0.5% at the most. I still think there is a fairly high probability we'll slip to the low 1970s - with VIX 15s...whether late today..tomorrow..or even FOMC-Wednesday. Regardless of when, I'll look to be a buyer then. Oil -0.8%... Gas +1.9%... interesting disparity.